September is typically the slowest tourist season month for Hawaii but this September was particularly brutal. Tourism is the foundation of Hawaii’s economy. While the other islands have had slight increases in tourism this year, the Big Island fell way short. Even many people that did come here said they had concerns and second thoughts. Are we going to be covered by lava? Blown off the island by a hurricane? Earthquakes, floods, wild fires, tsunami’s? For us that live in Kona, none of these were of any concern but it sure put a damper on our income. Enough whining…. How about the fishing? I’ve always liked fishing in September because the fish are still in summer mode. The “blind strike” ahi tuna bite typically starts slowing down but the bite is still happening and seemed to be more abundant than the blue marlin bite. Most of the marlin have been small with only a few big ones being reported. Mahi mahi season is coming up shortly but we have been lucky that the bite on those was pretty good all summer long. Last winter was good too. And the summer before that. In other words, the “season” has become more of a year-round bite for us for a while now. Just like last month, I didn’t do much bottom fishing. When I did, I did less jigging and did more drops with fresh tuna chunks. It’s rare to catch sharks on a jig but with tuna chunks, it’s the most common bite that I expect. I release all of the sharks, even the edible ones. Most shark species don’t have a urinary tract and secrete their urine through their skin so the meat tastes like pee. Even in nations that eat almost anything, they don’t eat those. Thresher and mako both have urinary tracts and they are the most common shark meat consumed. The shark I catch the most here is the sandbar shark. They average 50 to 150 lbs. and they have a urinary tract so they are edible. I even tried it once. Not bad but I could tell it was shark meat. In the Atlantic, sandbar sharks were harvested to near extinction so they are protected there but not in the Pacific. They are slow breeders so taking some out the environment puts a big dent in their numbers for a long time. The big plus for me (and my anglers) by releasing them is that we get to catch them again, and again, and again. I also re-catch the same giant trevally and amberjacks. I have tagged thousands of those so catching one with one of my tags in it is quite common. Reading the tag numbers gives me a record. Sharks have very tough skin so using common fish tags won’t work plus, the only way to get close enough to a shark to be able to read that tiny number would be to kill it, therefore defeating the purpose. 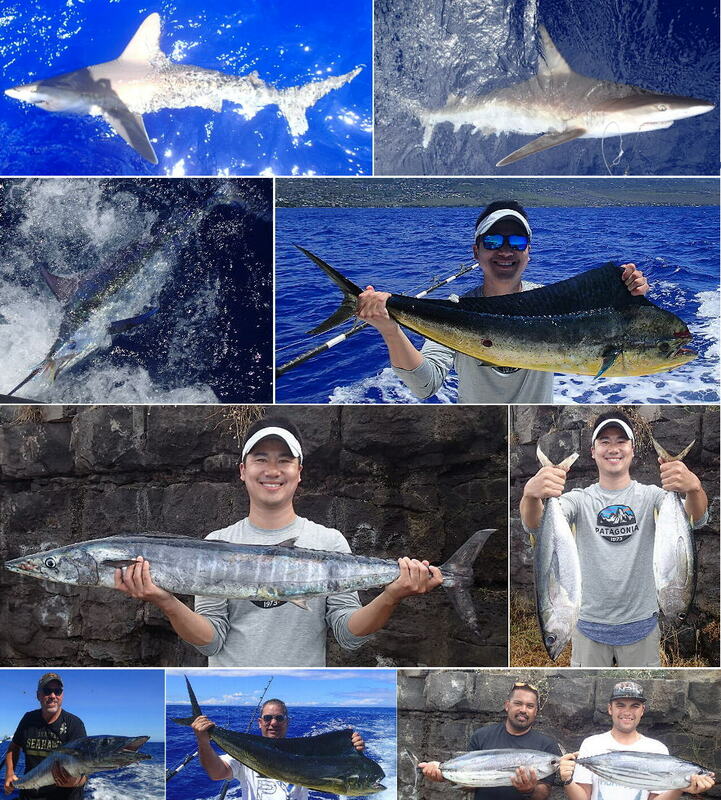 ← Kona Hawaii Fishing Report – August wrap-up.